Welcome to Week 42 of Paint Party Friday! As the year winds down to a close and we enter 2012, we hope you are all enjoying the holidays. It is so wonderful to see that so many of you are continuing to find time for painting even with all of the hustle and bustle of the season! Last week we discovered that most of us looove cookies (and we even had a couple of delicious sounding recipes and tips shared)! We were surprised to discover that some of us don't eat cookies! (What?!? Ha ha!) This week, we're wondering how you're planning for a fresh new year? Are you making resolutions? 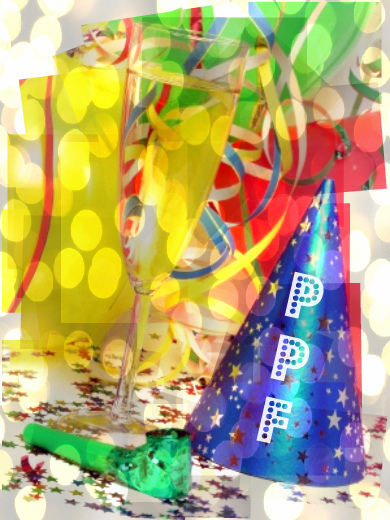 Please make sure to use your post URL address NOT your blog home page URL address as there are many late visitors who get confused as to which post is for PPF when they arrive (after Friday) at your website. If you are unfamiliar with Mr. Linky, an explanation of how this tool works can be found on Week 1 and Week 2 Check-ins. All our best wishes for a wonderful, happy, healthy, exciting, cheerful, prosperous, productive, creative, paint-filled New Year!!! Welcome to Week 41 of Paint Party Friday! It's fantastic to see so many of you still painting with everything else going on at this time of year! The Holidays are here and from the results of last week's poll, most of us are still scrambling to get everything done. We know that we are! This week we're having another lighthearted and fun poll. We want to know what your favorite holiday cookies are... Please feel free to share recipes (or send us some)! We want to wish you and your families all our very best wishes for a Merry Christmas, Happy Hanukkah and a joyous holiday season in what ever way you celebrate. Have a great celebration! 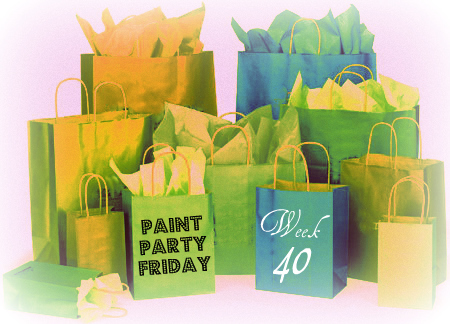 Welcome to Week 40 of Paint Party Friday! (Week 40! How fast the weeks fly!) The holidays are quickly approaching and we are thrilled to see that so many of you are making painting (and partying) part of your holiday traditions! For the next few weeks we are switching to fun, light and easy polls. 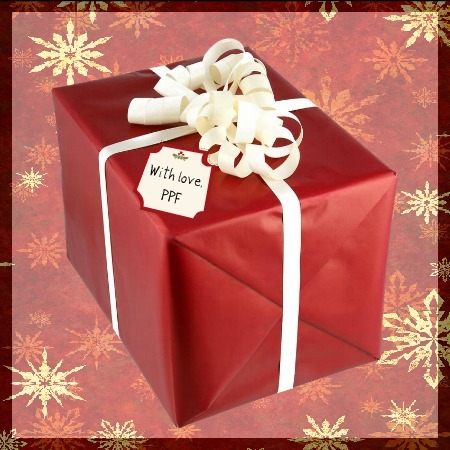 This week, we wonder - are you ready for the holidays yet? We hope that you find some relaxation (by painting?) in the midst of the holiday chaos and that you have a great time at the party! Welcome to Week 39 of Paint Party Friday! How great to see so many of you painting (and partying) here even in these very busy times! Last week we asked in the poll about whether or not you create paintings to reflect the season (whatever season it may be - Christmas is on many of our minds, of course, but we have seen lots of Hallowe'en inspired painting here at PPF too!) Many of you do paint for the season/celebration from time to time or depending on the celebration, others don't and some were inspired to try! This week we have a similar question as last - we're thinking about paintings as gifts - Christmas, birthday, wedding or other occasion. Do you give your paintings as gifts? Have a wonderful time at the party! So glad you made time to drop by and mingle! Welcome everyone to Week 38 of Paint Party Friday! We hope those of you who celebrated American Thanksgiving last week had a wonderful long weekend, that your clothes do up (again) and that you found some time to paint! We have been seeing a trend lately.... a lot of your paintings are starting to look a lot like Christmas! So we thought we'd ask about the impact of seasonal celebrations on your art. We hope you'll also tell us your favourite seasonal creation in the comments! 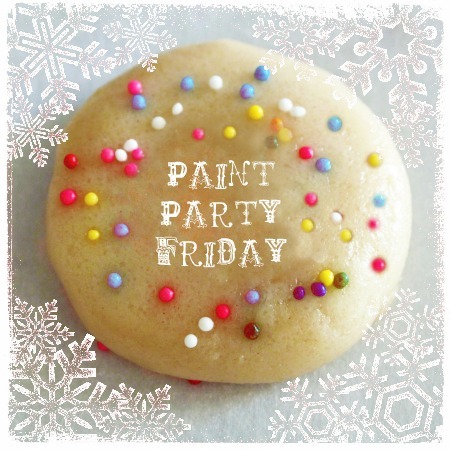 Hope you have a fabulous time at the party and that you still have time to paint at this crazy time of year! P.S. 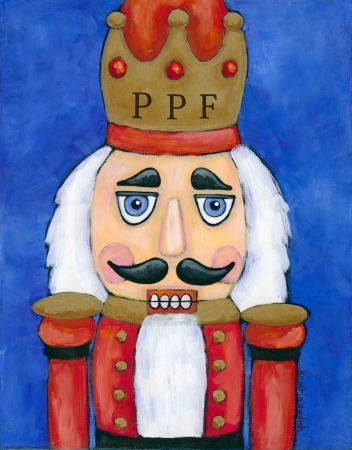 BTW - the charming and wonderful nutcracker above was created by Kristin during her 30-30-30 project last year and was excitedly bought by EVA to join her extensive nutcracker collection. We both love him and thought he would be fun to share with you!